Wednesday, October 10th, I went to the Nasher Museum at Duke to hear a lecture given by Chicago-based painter, Kerry James Marshall. 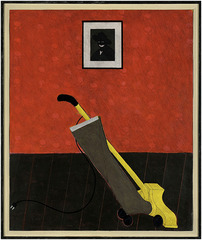 One of the first slides that he showed during his presentation was this painting from 1981, "Portrait of the Artist & a Vacuum." This piece is currently on display and is a part of the Nasher's permanent collection. Marshall has studied the history of painting very extensively and the trajectory that he's followed as an artist reveals the extent of his studies. Along with tackling the history of painting, a lot of his work deals with the idea of the hierarchical value assigned to skin color in the black community. He paints these figures that are literally black. The paintings are remarkable, but he says that there are conflicting responses to the figures. Some claim to love that they are so emphatically black and see them as undeniably beautiful. Others have difficulty seeing that same blackness as representing beauty. My personal attraction to and fascination with his work was solidified when I came across the painting above. It belongs to The Garden Project series he completed in the mid '90s. I lived with my mother and two sisters in Altgeld Gardens until I was 11 years old. I often point to this place as an environment that significantly shaped my early childhood development and present worldview. How many people have seen their own homes represented in the work of a prominent artist? Not many, by my estimation. The last picture that I've posted here is an image capture of a Google Map situated in an area of Altgeld Gardens. The landscaping is very different from what I recall, but I also hadn't spent any time viewing the place from hundreds of feet above. The image within the pink frame is a snapshot of a gathering for my sister's 3rd or 4th birthday. I like the kind of interior specificity this particular Polaroid offers compared to the architectural homogeneity presented in the map. Marshall's painting offers another kind of specificity that I really enjoy. No one else could have made his paintings. How many master painters are there from Nickerson Gardens by way of Birmingham, Alabama? I have no idea, but I imagine that that number is very small. I suppose the ratio of master painters to every other kind of artist on the planet is also relatively lopsided. Who paints nowadays? I'm saying all that to say that the world is constantly changing, shrinking, growing, and moving all around us, so it's nice to find yourself in a place where something that feels important is happening. Right place, right time, and all that. I had that feeling during his lecture.